Owner/Operator of this Blog. Pamphleteer De Lux. I lived in a Gun Control Paradise: It sucked and got people killed. I do believe that Freedom scares the political elites. Why the hate about Conversion Therapy? If you think about it, Liberals have a long and sad story with Conversion Therapy because it transforms other Liberals into Conservatives. How many times have we heard “I used to be Liberal and anti-gun, but I got (beaten-robbed-shot-raped-etc.) and now I know better”? That is Conversion Therapy right there. Reader Adam P reminded me of this Clint Video. Thanks! 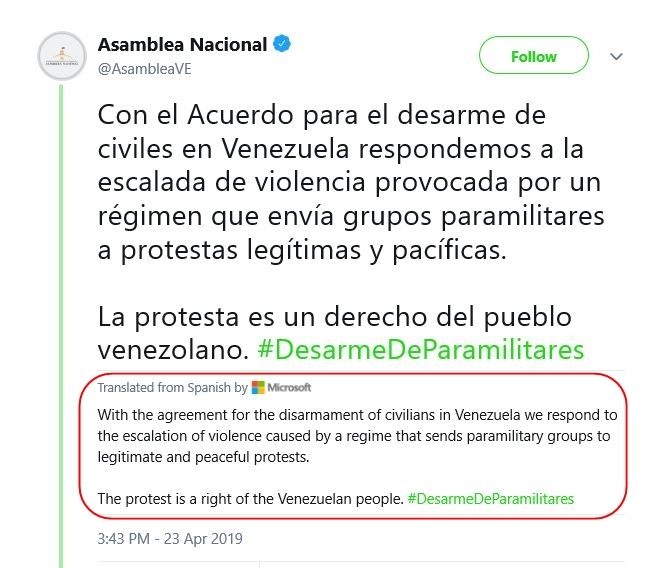 The Venezuelan General Assembly supposedly came up with the solution to eliminate the Colectivos, the armed pro-government goons that roam and attack any opposition activities. Civilians having and carrying guns is already forbidden, so let’s do that again in two layers because it worked so damned well in the first place. The Colectivos are criminals and we all know how well criminals obey the law, right? But we cannot forget is that even if Maduro leaves, even if Chavismo is rooted out, Venezuela will still be governed by people who do not want civilians to be able to say NO with a bang when the Government violates Human rights. 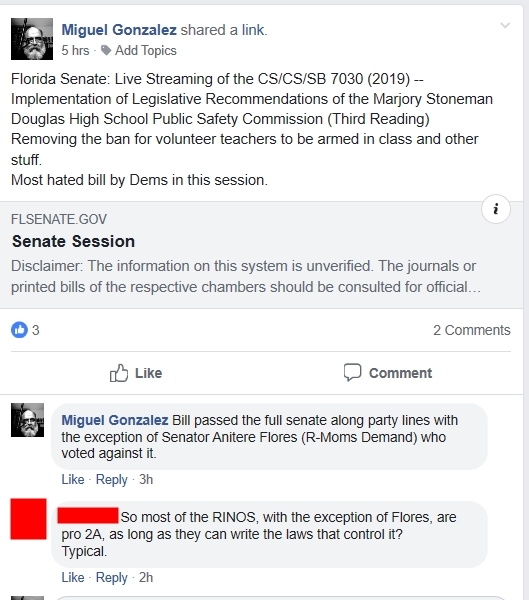 Florida Senate Passes Armed Teacher Program, Hysterics explode. After the Senate bill was approved and the news media got it published, the reactions in Social Media were absurd and hilarious. The lack of information about the bill is amazing. Of course, this is by design mostly by Gun Control and the Media laps it and regurgitates it to the uninformed idiots. You maybe have noticed in my updates that I used the expression “volunteer teachers” when talking about this bill. Again, I do believe it has been done by design that the information put out there seem to “suggest” teachers would be forced to carry. which is a lie. This sentiment is repeated over and over, almost being the top selection. Always with the poor teacher badly paid. 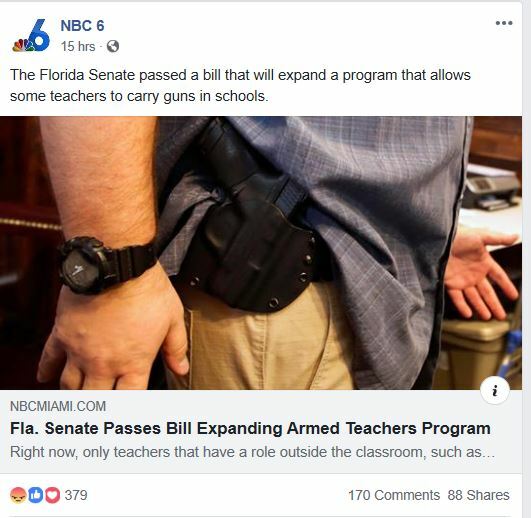 It has nothing to do with keeping schools safe and the teachers that volunteer will have their training paid so this is just bitching for bitching’s sake. Again, total ignorance on what’s in the bill and the steps a volunteer teacher would have to take in order to become a Guardian. Teachers are mental cases. And that is not only the “informed” opinion of parents but also fellow teachers. All this brings a question: How in the name of God are we letting kids in the hands of people we all “know” to be mentally unstable? If they are that bad, they can snap, ignore the law and bring their gun to class, lock the door and start popping kindergarteners anyway. But it is easier to crap on teachers for political purposes. The sad part, teachers that are so insulted remain silent so I have to believe they are cowards for not standing up and tell these idiots to shut the hell up, or they are truly sick in the head. Venezuela: Meet the new boss, same as the old boss. I had been suspicious of Juan Guaido, Interim President of Venezuela. Just like Shannon Watts, he B.S.ed in his bio trying to pretend to be somebody from the low middle class, when he really is not. In other words according to the “solution” to Venezuela’s problems, Socialism was not really tried in Venezuela. 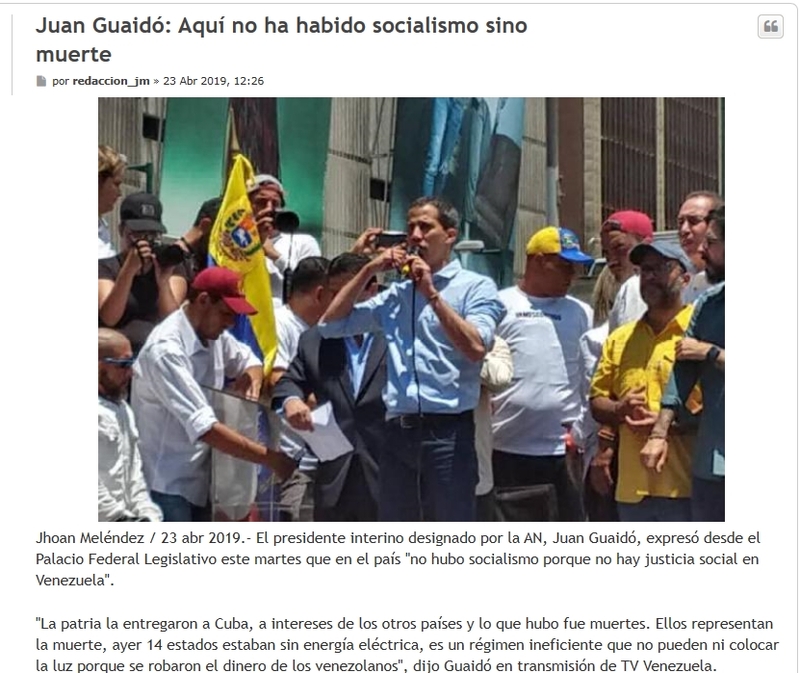 He went on to say that “There was no socialism because there is no Social Justice in Venezuela.” Guaido turned out to be another Latin-American Something-Socialist after all. That country is pretty much doomed to repeat the same crap all over again. At least we don’t have soldiers losing their lives over there. MIAMI (AP) — The Florida Supreme Court on Tuesday ruled against a sheriff who fought his removal from office after the governor claimed he failed to prevent last year’s Parkland school shooting. Florida’s highest court agreed that Gov. Ron DeSantis was within his authority to suspend Scott Israel as Broward County sheriff earlier this year. The justices noted that under the Florida Constitution, the state Senate is responsible for deciding whether the removal should be permanent. Israel has said DeSantis overstepped his constitutional authority and interfered with the public’s right to elect their sheriff. Israel’s attorney didn’t immediately respond to an email from The Associated Press seeking comment about Tuesday’s ruling. I think Israel should call Opa-Locka PD Human Resources and see if the job of Chief is still available because I doubt the Senate is going to contradict Governor DeSantis. Great piece of advice but, will it be followed? But most hardliners seem to think that all battles are worth fighting all the time, everywhere, and with maximum intensity. No one fights wars that way and wins. You have to take a lot of limitations into account if you’re waging war or waging political struggle. Hardliners don’t accept that there is a limit to our political influence. They fight as if we had 200 million other Americans behind us. Generals who fight that way lose armies. Political movements that are similarly unrealistic end up similarly destroyed. 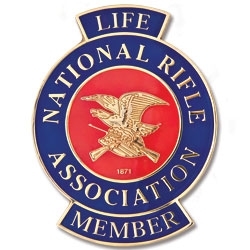 We need a reform movement for NRA that understands limits and is politically realistic. If such a movement were to appear, I would support it. NRA needs a Reform Movement that’s Realistic. There are 2 groups of gun people interested in a re-shaping of the NRA: Those who really feel we need to improve and get a second wind and those who want payback and payment. Sometimes you just want to say “Fu** it!” and let them drown. I don’t think people appreciate how Senate Bill 7030 approved by the Florida Senate today marks an important milestone. 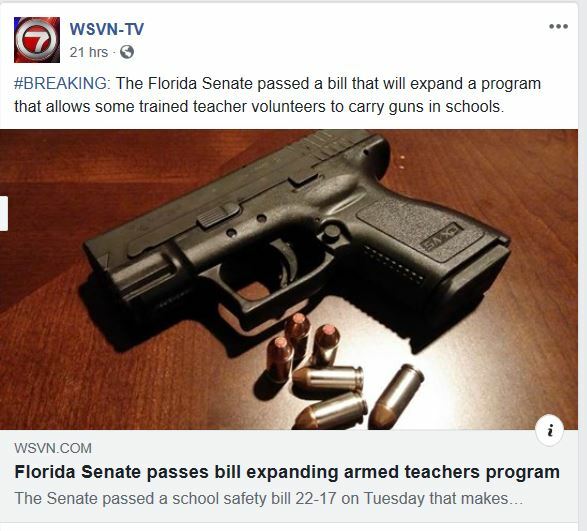 Within the bill is the lifting of the banning for volunteer teachers to participate in the Guardian program and carry a firearm in class. While far from perfect, it is a tremendous setback for Gun Control in Florida and in the US: it reversed part of a law that was pushed in with tremendous pressure last year and possibly as much not to change this year. We are talking hundreds of millions of dollars in lobby and free media went to waste. As I said, one small step but in the right direction. Even Bill Galvano, Republican and Senate President who received at least $200K from Bloomberg, voted in favor of the law. But as we can see, the gain seemed useless to at least on Floridian in a certain Florida gun rights organization. I do believe this is the kind of person that if you give him 9,999 rounds of premier free ammunition, would throw a temper tantrum and reject the whole batch because one bullet is missing.